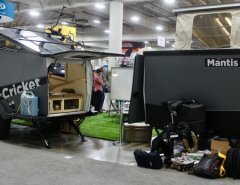 The MeerKat is designed by Little Guy Trailers in Southern California. This tiny trailer model is called the Meerkat because it “pops up everywhere”, and it’s side windows look like a meerkat’s facial markings. Therefore, their cool logo. 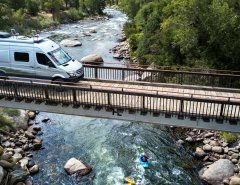 At 900 lbs, this is an easy towing trailer for those new mini cars, or any small and economy car that you already own, keeping your fuel economy low. 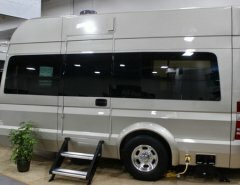 All the windows open, roomy enough for a camper this size. At 6’ tall, you can stand up inside, but can also be customized up to someone 6’5” . Has wood cabinetry, 12 volts, 120 volt electrical system with lights, converter, power outlets, and custom made headliners. They also include a portable propane stove. Top pops open, all of the cushions have storage beneath them, hand pump sink using your own container, or RO and therefore not stuck with city water. Features include a hanging closet, porta potty, icebox, sink, ample lighting, and a bed that comfortably sleeps two. There is also lots of cabinet and drawer storage. Nice sized entry door as well for something only 900 lbs. Full size wheels with stabilizers, LED running lights on the exterior, with an attractive wrap around bench seating area and a small table (optional larger dining table is available) that converts to a queen size bed, blinds, services for adults for meals with the bench seating and table. Awning design also available for the exterior for shade and to create an outdoor patio. MeerKat owners are people who enjoy camping, but don’t want to sleep on the ground anymore. The MeerKat is for somebody who would rather be camping and exploring than preparing an RV and a big tow vehicle for a trip. 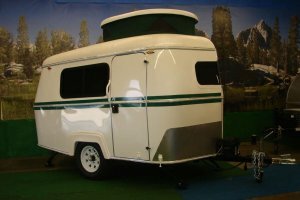 The trailer is fully insulated and offers windows on each side and on the front and back. Three of the windows open as do the vents in the top because you can never have too much ventilation on hot summer days. GAWR (Axle Rating): 2000 lbs.